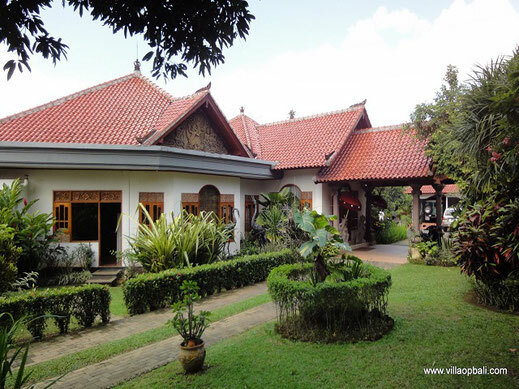 A beautiful villa in forest surroundings, build in Indonesian style but provided with all the western comfort. 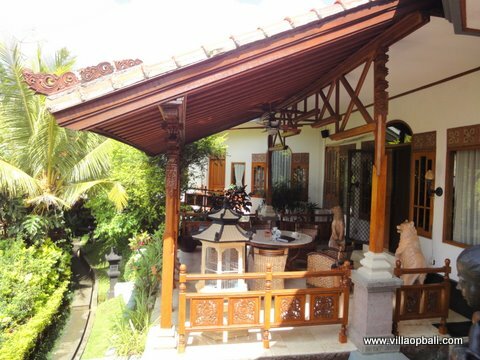 The villa is set on a plot of 4400 square meters just at the boundaries of a small Balinese traditional village in Tabanan, about 30 minutes driving from Seminyak. 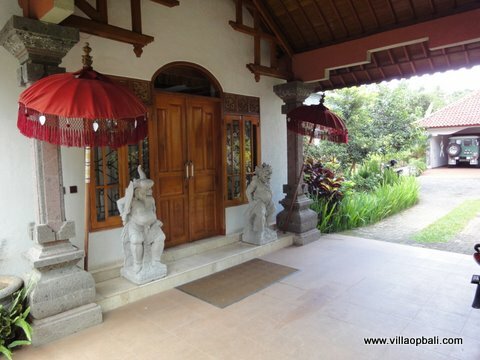 The entrance of the villa is at a village road but the location itself is set in a “jungle like” area. 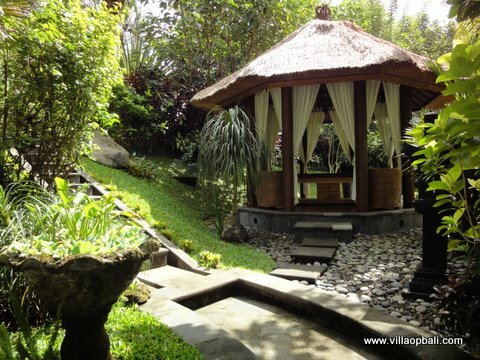 A beautiful location with lots of green plants, big trees and a view at the river. 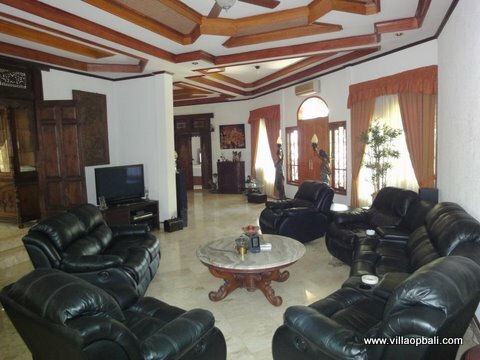 The 4400 square meters consist of different levels. 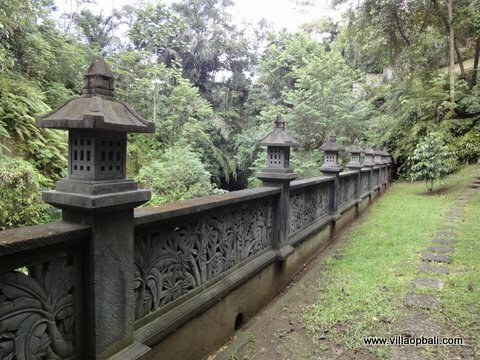 At the bottom of the plot is the river. 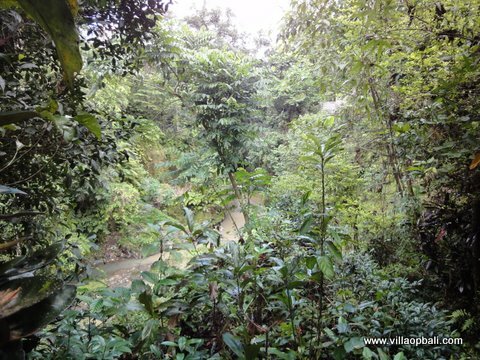 Here the owner constructed a huge underground retaining wall to keep the soil on its place, very important if you are next to a river. 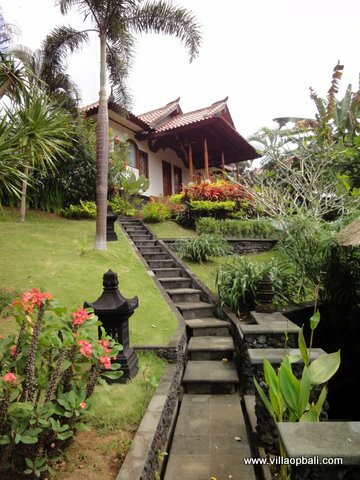 On top of this retaining wall is the stone wall in Balinese style. 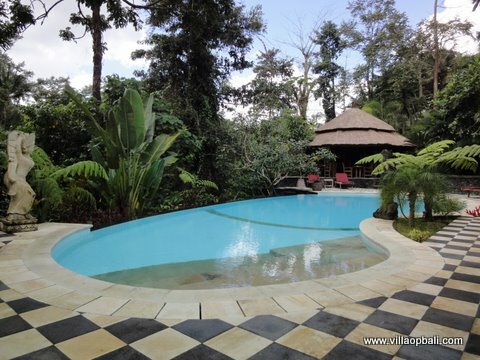 When you go up to the next level, over the stone path steps, you will find the huge pool in the middle of this level. 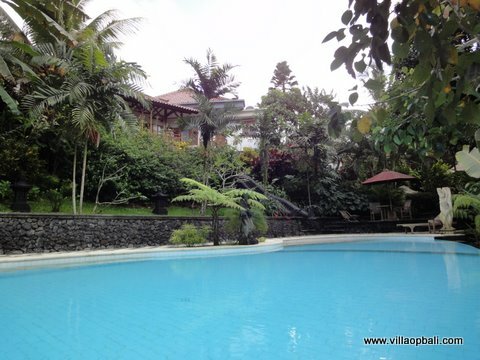 The pool is oval free shaped and invites you to swim between all these green lush surroundings. 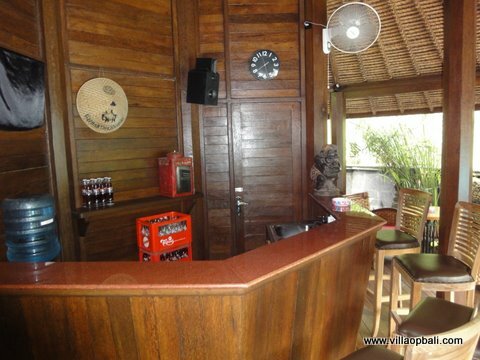 Next to the pool is a large gazebo, a nice place to entertain your guests and this bar gazebo is equipped with a TV set, bar with seats and a fridge to keep the drinks cool. 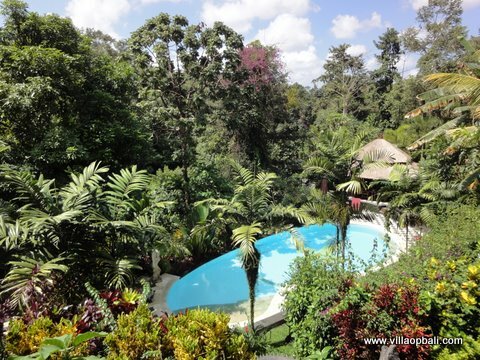 Of course the pool is surrounded with a sun deck for the sun worshippers. 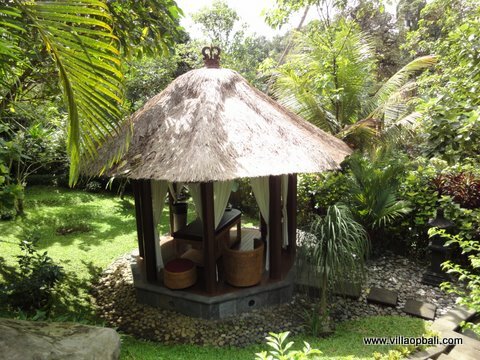 A very nice feature is the massage gazebo, placed separately from the pool to have some privacy while you are enjoying a Balinese massage. 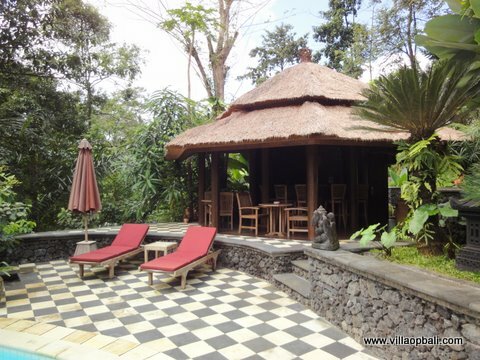 Coming from the gazebo bar up to the next level you will discover a guesthouse, build separately from the main building so your guests can do their thing without disturbing other people.This guesthouse comes with its own kitchen, living and en-suited spacious bedroom. 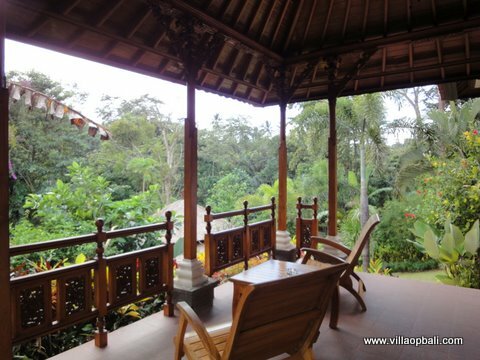 Of course in front of the guesthouse is a covered veranda with a overall view over the jungle in opposite. 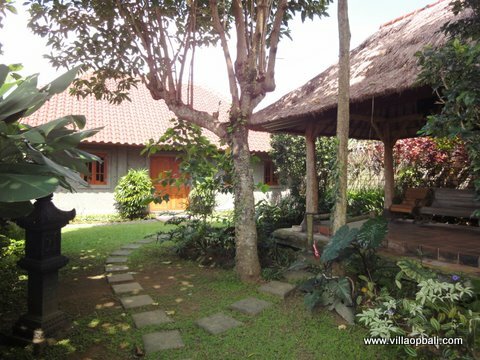 At the back of the plot the owner build his own workshop, his hobby is timber work and all his equipment is present. 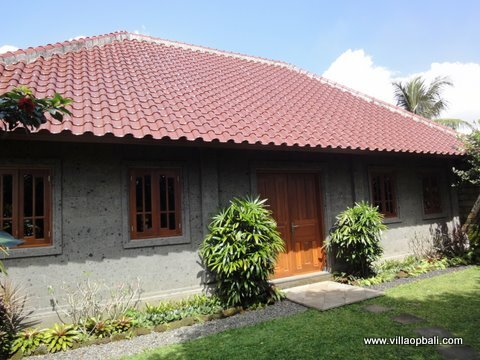 Because this is a rather new building the owner considered that this also could be an extra guesthouse, should you require so. 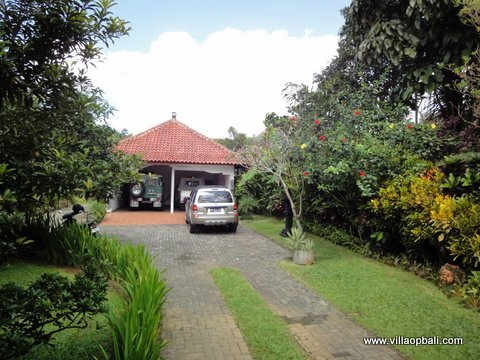 A big garage is next to this workshop, and you can park 2 cars here. 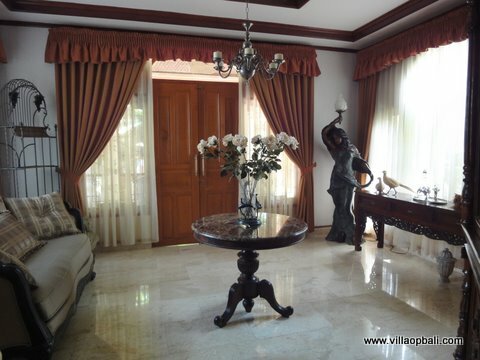 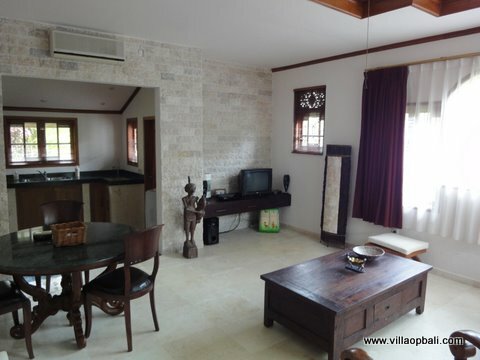 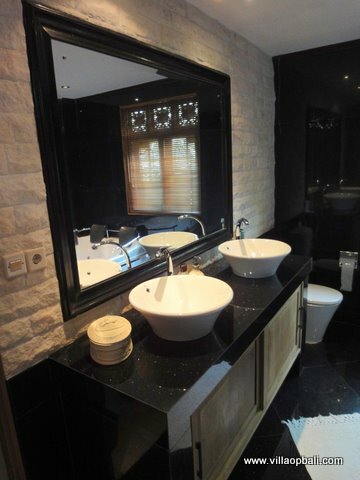 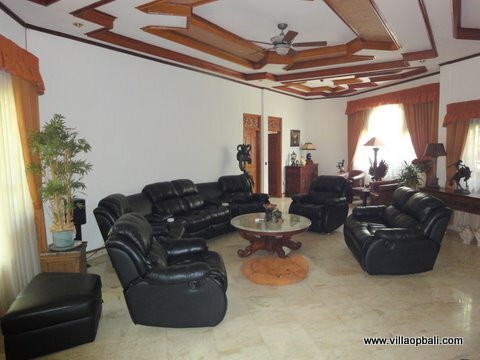 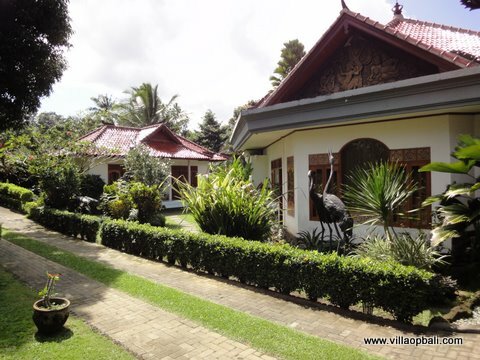 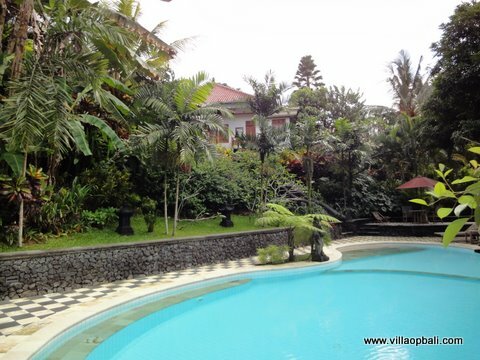 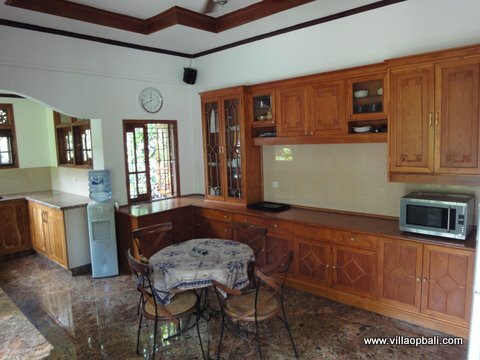 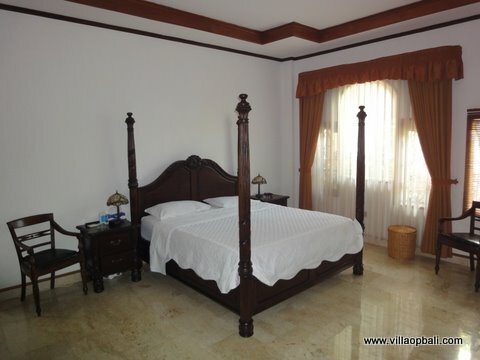 The Villa…….the villa is spacious and has three bedrooms. 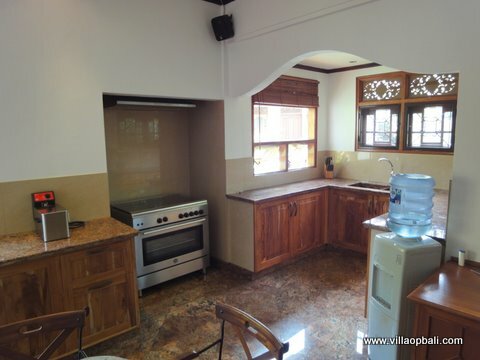 The large and western style kitchen is separate from the indoor living, through a doorway you will enter the living. 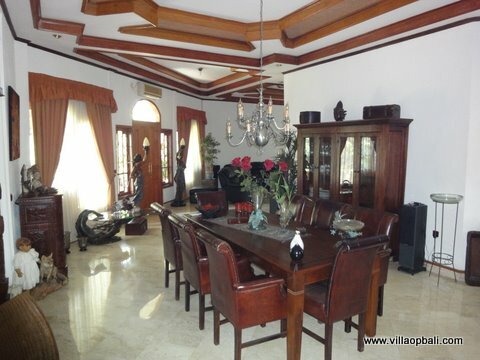 Spacious and luxurious with a dining section and entertainment section, the floor is covered with high quality natural marble stone and the ceiling is decorated with timber work. 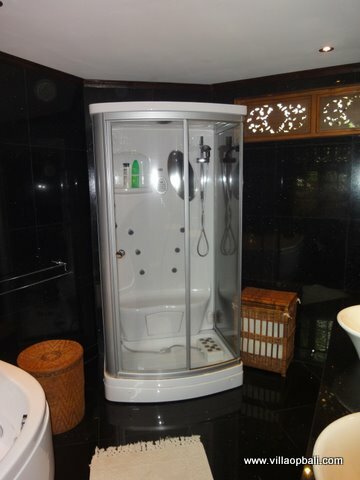 A guest toilet is available at the main entrance of the living. 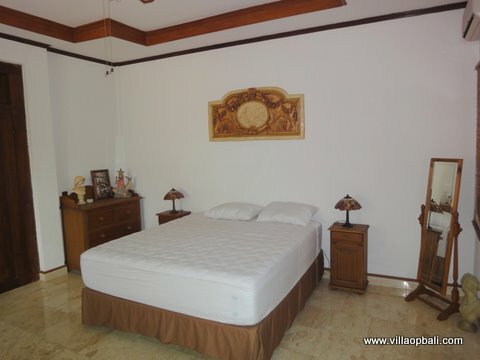 The master bedroom is spacious and equipped with an air conditioner and en-suited with a luxurious bathroom. 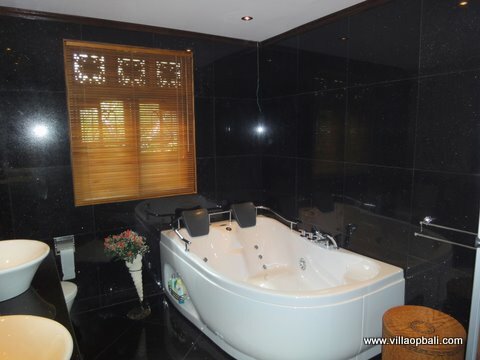 The bathroom has a separate shower and bathtub with build in Jacuzzi. 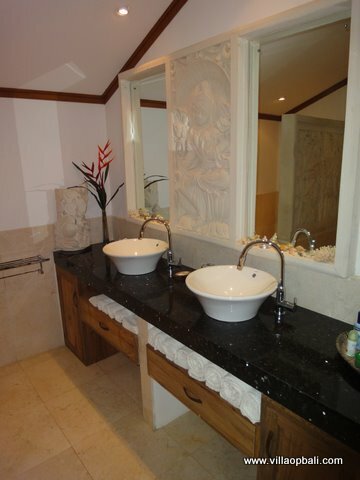 The walls are done with a dark colored granite stone. 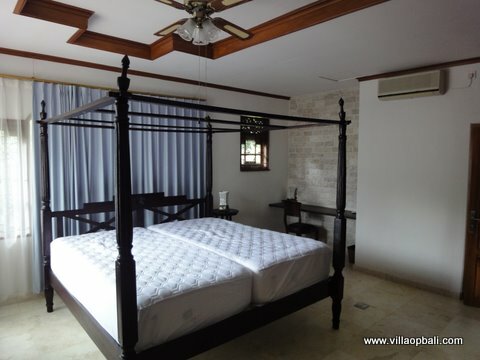 The other en-suited bedroom does have a small balcony with breath-taking views over the swimming pool and forest. 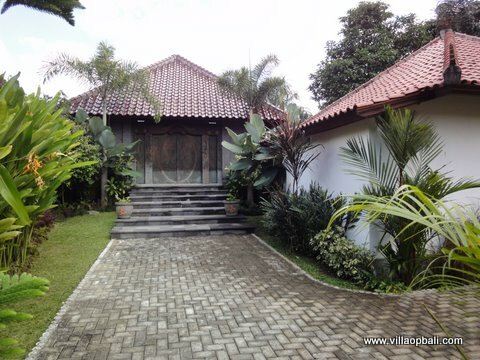 We tried to describe this villa with this piece of editorial text but take our word for it that this hardly describes it sufficient, you really have to see this villa set on this location. 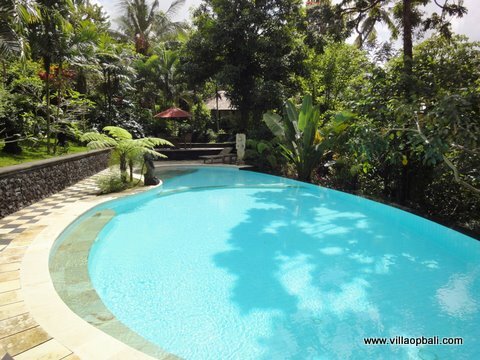 The only thing left to say, it is at a good 30 minutes drive from Seminyak.